Comets are worlds of ice and rock. Incredibly a machine made by man has now visited one. They are unpredictable, often promising naked eye visibility and then becoming fuzzy blurs. Still, one day we’ll get an amazing sight! 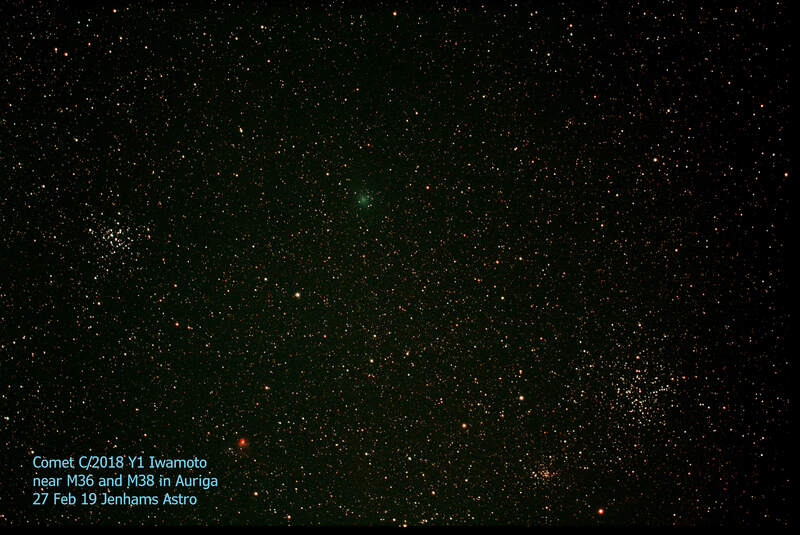 Comet C/2018 Y1 Iwamoto near clusters M36 and M38 in Auriga. 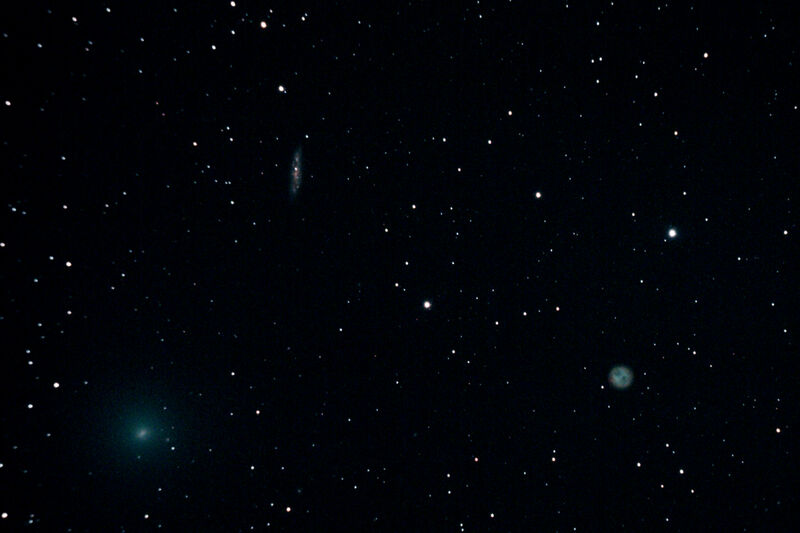 The image is a stack of 21 x 30s frames at ISO 1600, taken using a William Optics GT81 with a 0.8x reducer/flattener. Cropped view of Comet 46P Wirtanen. 13th December 2018. WO GT81 + 700D. 26frames of 25s at 1600. Comet 41P passing M97 and M108 on 22nd March 2017. WO GT81 11 x 75s at ISO 800. I couldn’t see it visually but the camera captured it well. Image of Comet Lovejoy from January 10th 2015. The sky was only clear for short periods between rain clouds, but I managed to capture 10 x 90s frames at ISO 800. The image was stacked using Deep Sky Stacker’s “Comet mode”, with the option chosen to trail the stars and not the comet. The tails are very fine. When I initially stacked the frames without Comet Mode, the nucleus of the comet became a series of smudges each one slightly offset from the last, as it moved against the background stars. Deep Sky Stacker is a clever program! Another Lovejoy image, this one using just 3 consecutive frames, without Comet Mode. The conventional stacking aligns the stars well, but the tail becomes lost. Comet PANSTARRS from 2014. 6 x 60s frames revealed the gas and dust tails heading in different directions. 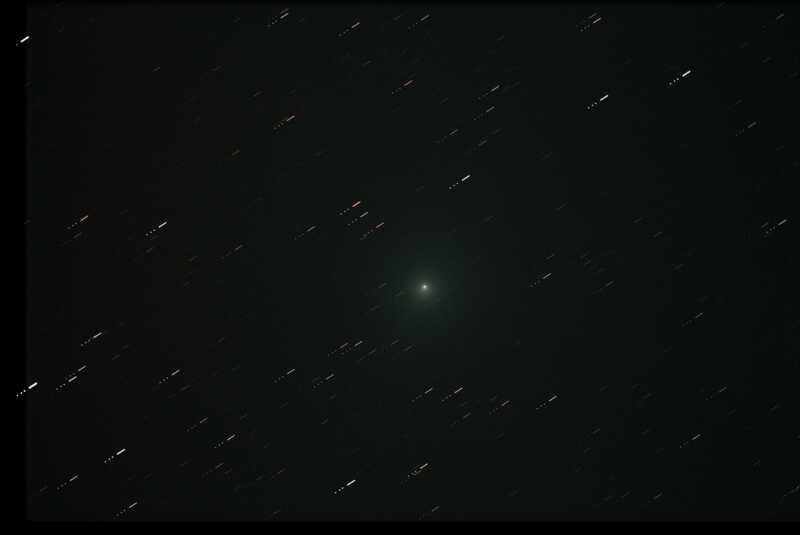 Comet Hyukatake taken amidst light polluted skies in 1996, before I owned a digital camera!